A higher education advisory company has launched an application to help campus administrators identify candidates most likely to apply, accept and attend their schools. 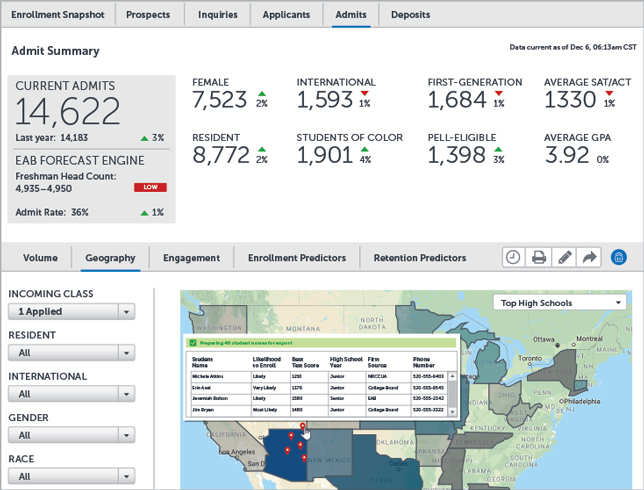 EAB's new Pipeline Analytics uses machine learning on data gleaned from 1.5 billion student interactions across the U.S.-based college-bound high school student population to support customers in tuning their student recruitment strategies. Insights on engagement factors for boosting overall enrollment. "Colleges and universities face an increasingly unpredictable enrollment environment, a decrease in the traditional college-going population in some areas of the country, heightened competition and more students accessing higher education who are the first in their families to go to college," said EAB President Chris Marett in a statement. "Enrollment managers need an accurate picture of what their classes will look like, the tools to identify and influence right-fit students before it's too late, and the ability to partner with the academy to improve student persistence." The use of Pipeline Analytics, he noted, would help schools draw from non-traditional student populations, including people in other parts of the country or from traditionally underrepresented demographics. The new program works with EAB's existing services. For example, according to the company, by combining Pipeline Analytics with the student success management system, administrators will be able to find those students who will arrive on campus less likely to persist to sophomore year. The goal is to help institutions connect students with advisers "even before school starts."